Unlike most national parks, Mesa Verde National Park is most known for being a bridge to the past. As the largest archeological preserve in the U.S., the park has over 600 cliff dwellings and 4,000 sites to explore and see. Founded in 1906 by Theodore Roosevelt, Mesa Verde National Park is a UNESCO World Heritage Site and is home to what is considered the largest cliff dwelling in North America — Cliff Palace. Cliff Palace dates back to over 700 years ago and is a multi­storied ruin. As the most popular site in the park, Cliff Palace housed nearly 125 people at one time. Along with Cliff Palace, there are other great sites to visit such as the Balcony House with its 45 rooms and Long House with 150 rooms spread out, unlike the clustered cliff dwellings. Along with the historic sights, the park offers several different hiking trails for more discovery away from the cliff dwellings. 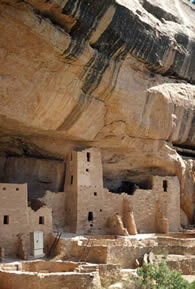 Mesa Verde National Park is also a great location for field trips for schools. As one of the best preserved Ancestral Puebloan archeological sites, the park offers a unique opportunity for kids to learn about archeology and history. Because of the extensive number of sights to see, Mesa Verde National Park lodging allows visitors to spend enough time to be able to see all that they can. Whether it’s for a half a day or for four, Mesa Verde National Park is a definite must. The Far View Lodge: Mesa Verde is known for its ancient cliff-dwellings, but just as the cliff dwellings provided safety, comfort and a relaxed place to stay for the Pueblo people over six hundred years ago… today, the Far View Lodge provides travelers and guests with a comfortable and unforgettable experience at Mesa Verde National Park. The Far View Lodge provides the only lodging option inside the park. Just 10 minutes outside of Mesa Verde is Willowtail Springs, a beautiful little lodge resort that will make for a great base camp during your Mesa Verde vacation. Mesa Verde is the Spanish term for "green table" a name given to this area because of the large plateau that makes up the geography around the park. But Mesa Verde is much more than just a unique geographical feature, it is a spectacular glimpse into the lives of the Ancestral Pueblo nation who called this place home for nearly 700 years. Mesa Verde is both a US National Park and a UNESCO World Heritage site which occupies some 80 plus square miles near the Four Corners area in southwest Colorado. One of the most popular features of the park are the ruins of stone-built homes which the Pueblo people constructed within caves and under outcroppings of the canyon walls in the area. The cliff dwellings here at Mesa Verde are a spectacular site to see, and are said to be the largest cliff dwelling in North America.